Here in Central Oregon we love natural wood accents on homes. Drive down any street and you’ll see numerous homes adorned with wood doors, cedar shingles, picket fences, cedar fences, craftsman style posts and braces, and columns and beams galore! These wood elements are beautiful and add a lot of character to a home. The downfall however, is that they require a lot of maintenance. How much maintenance? That all depends on the type of surface we’re talking about, the exposure level to the sun/weather, and the desired appearance you’re wanting to maintain. At Webfoot Painting, we’ve got you covered. We’ll walk you through the entire process so you understand just exactly what is required to maintain these surfaces. We’ll explain the importance of regular maintenance and assist you in putting together a maintenance plan that fits your home’s needs. With most surfaces you want to treat them before they look like they really need it. Things to look for are light water marks, fading, or any dry, discolored areas. If you catch it early, the amount of prep work required is greatly reduced. We preach maintenance because it saves you money! Once shingles or posts have become severely weathered, there’s not always a lot that can be done except hide these areas with increasingly darker stains. The general rule of thumb is the lighter the stain tone, the more frequent you will need to apply a maintenance coat. This is due to the fact that most of the protective elements within exterior stains are found in the pigments. - Thorough cleansing of the surfaces to achieve an even appearance, often times through the use of wood cleaners and brighteners. - Complete coverage and protection of all siding, decking, hardscapes, landscaping, and ground cover around the surfaces to be stained. - Stain stains! We over protect just to be safe. - Clean application of stain, typically by hand with a wool pad. - Spraying of stain is only for certain applications and can result in unmanageable overspray if performed incorrectly. - Thorough clean up and proper disposal of all stain rags and masking materials. - Fire hazards are extremely dangerous and common in Central Oregon and we never take them lightly. "Webfoot Painting stained our home last summer, and they did a fabulous job! They covered the plants and shrubs with tarp to protect them, cleaned up afterwards, and you could never tell they were even there, except for the beautiful fence! Highly recommend them! Very professional, too!" Linda F.
"Professional, personable, on time and on budget, Webfoot is an extraordinary partner who I have no hesitation in recommending. 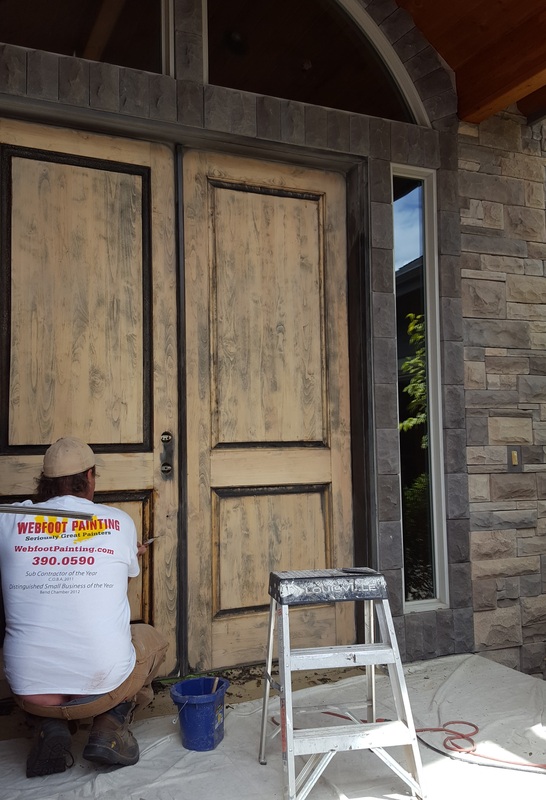 We have extensive exterior wood trim that required acid washing, prepping, and staining and the results were just gorgeous." Jennifer T.
If you browse your favorite design sites or magazines and look at the living rooms featured, one of the most common elements you’ll notice is a beautiful fireplace. Thankfully, with modern technology we are past the days of needing a fireplace to cook our food and keep our home warm, but their welcoming nature has earned them a permanent place in home design. Whether or not your fireplace functions, its mantle and surround have huge potential to add style and architectural interest to your living room.